Stop reading this post for a second and think about your body. Do you have neck pain, aching wrists or forearms? Perhaps your shoulders feel tight? For many of us that work seated for long periods of time, MSDs (Musculoskeletal Disorders) is a constant risk and could even have become a chronic problem. Often when working in a micro business, which tends to be based at home, choosing the right desk, chair and other peripherals to support good health is ignored. Over the years I have made changes to my working environment to combat the risks of MSDs – all of which I have had first-hand experience of. The good news is you can make simple changes to avoid damaging your health, as you develop your micro business. Now, there’s been a long debate about the sedentary lifestyle we are all now leading. As the vast majority of us sit when working, the sit/stand desk has become somewhat of a poster child for healthier working practices. Research from the University of Leicester, published in the British Medical Journal showed that equipping workers with sit/stand desks could result in better health, less fatigue and reduced back pain. The research group was small (just 146 office workers), but this research does add to existing findings that standing for a period of time is good for you. I have been testing this for the past year. Investing in a sit/stand desk from Ikea, I am standing as I write this. I try to vary my time sitting and standing throughout the day. Have I experienced any benefit? My shoulders feel much less cramped and lower back pain is reduced. Adding to my desk is a large keyboard that is easier to type on. A mouse mat with a built-in wrist rest. And I have modified my Apple Magic Mouse with MagicGrips to make it much more ergonomic. When I am seated, I have a footrest to bring my legs into a more comfortable position. And the chair I use is fully adjustable and has a lumbar support for my lower back. The investment in a sit/stand desk is not low cost. As such, I wanted to find out if you could augment an existing desk with any new technology. A new business might have the solution you have been looking for. Is the technology we use every day at work damaging our long-term health? “Yes, it's fair to say the more we are using technology, the more aware we are of the negative impacts it can have on both physical and mental health. Scientific evidence is also supporting this notion, recently via Harvard Medical School. “Whether it has a fundamental impact on our long-term health remains to be seen. However, it’s evident that large corporations are aware that spending long periods of time with technology is affecting users. In June, Apple CEO Tim Cook said: “sitting is the new cancer” and offered a standing desk to each of the 12,000 employees working at the new Apple Park headquarters. “The use of technology doesn't have to damage long-term health as long as workers take breaks, exercise regularly and limit screen time. The issue is that most people don’t take the time to implement these activities and it’s having knock-on effects. Is choosing more ergonomic furniture or augmented existing desks etc. helping to improve the health of workers? “Obviously using ergonomic furniture such as standing desks to promote activity, posture and movement are all positives. New workplaces and co-working facilities are opening more opportunities for people to work ergonomically but realistically, workers need to be educated on how and why to use ergonomic furniture for it to impact in the long run. “It means a change of working practice, routine and lifestyle which needs to be promoted across every organisation and driven from executives at the top. From our perspective, our success stories start with HR managers who are aware of the benefits of good ergonomic practices and are taking the right steps to make sure that all staff are looked after properly. Companies must adapt to this change to really start making a difference. What prompted you to start Deskmate? I think you have said it started as a classic side hustle? “My business partner Arthur and I met at Escape The City – a start-up incubator in late 2016. We were both working out of Google’s co-working space, Campus London after finishing the course. “The downstairs space was affordable (free) hence it was cramped, busy and there were no standing desks available. At the time, Arthur was suffering from neck problems and was told by his osteopath to invest in a standing desk to help alleviate the pain. We did some market research and found that there was an abundance of ergonomic furniture available, but all between £200-1,000. It was all clunky, static and overpriced. We spotted a gap, started Deskmate and here we are today. What easy steps can businesses take to make using their working spaces safer and more ergonomic? “From our experience, while some workers drive the use of ergonomic furniture through need (pain, an interest or recommendation), directors and managers need to promote this type of working from the top down. And for us, a healthy working environment is as important as a safe working environment. “Healthier people means healthier business, fewer days off and more energised teams. In 2016, 30.8 million days were lost due to musculoskeletal problems (including back pain, neck and upper limb problems) according to the NHS. This is the second biggest cause for absences at work. “Initial steps for a business to take would be to find out how people want to be supported at work, whether that’s through initiatives like furniture, working hours or wellness practices. From a practical point of view, look at your organisation and see what changes you can make to deliver a healthier working environment. Furniture like standing desks, ergonomic chairs and mats are now readily available. Are micro businesses, in particular, looking for cost-effective solutions to help them work more efficiently? “From our customer analysis we can see that affordability is the number one reason for using Deskmate, so I’d have to agree that cost-effective solutions make financial sense for micro businesses. “Extensive wellbeing programmes, high-cost ergonomic furniture and upfront cost all impact a business's bottom line. And if more affordable solutions can be implemented as effectively, why wouldn’t you? Having said that, we see demand in our product from SMEs, start-ups, but also large corporates. What does the future of ergonomic design for working spaces look like? “I think you have to look at how ergonomics is changing to answer that question: In previous years, it centred on prevention of injury and illness but now that focus has morphed to workplace wellbeing and this is likely to continue. “The one size fits all approach that has been previously adopted is likely to be phased out. The customisation could play a key part in ergonomic design moving forward. As a company, we’ve recently introduced customisation of product in terms of design but also size. “At most co-working spaces, employees can utilise an app to pick furniture at the click of a button and it’s likely ergonomic design via the same click is not a million miles away. We’re hosting regular pop-ups at most of these spaces and the growing trend for flexible, fun and open workspaces is not going to slow down anytime soon. “If you look at companies like Google and how they invest into infrastructure and office space (there’s a running track on the roof of their new Kings Cross HQ), it’s evident that design is expressing their values and it’s likely that other offices that house smaller companies will have to follow suit." Micro businesses are often characterised by people working in shared co-working spaces or working on the move. Will more flexible and portable ergonomic solutions have to be developed to support these new ways of working? “I’d like to think Deskmate is an early stage development in flexible and portable solutions for businesses. We predicted co-working spaces and their members were going to be early adopters of our product, and they’ve proven to be. Unlike traditional office setups, flexible workspaces understand the value of portable ergonomic solutions, perhaps due to initiatives like hot desking, standing meetings and communal working areas. “I think that’s why we’ve seen a steady increase in businesses approaching us for a more affordable way to get workers more active, and a huge portion of our customer base are made up from those people that work remotely or from different spaces. 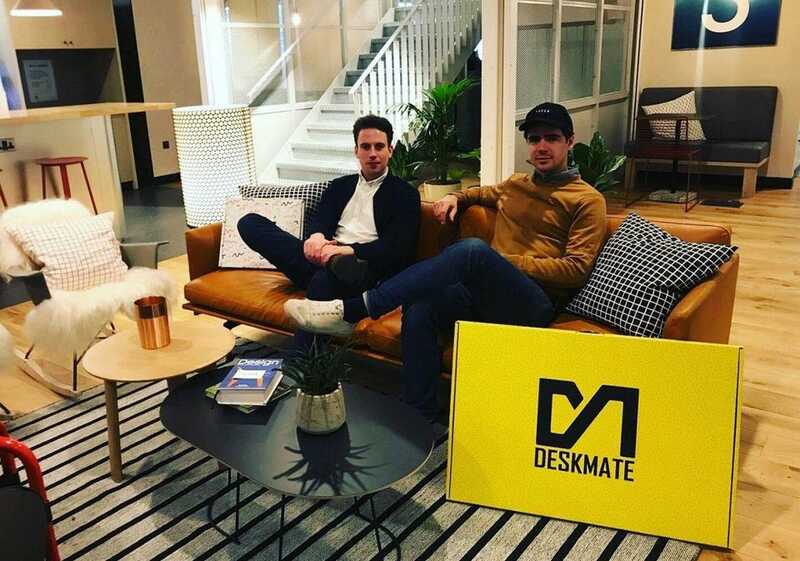 The demand for flexi-working doesn’t seem to be slowing and it’s why (we hope) products like Deskmate will flourish. Micro business owners should, then, assess their working spaces and how they use technology to identify where improvements could be made. You’ll be astonished how simple low-cost changes could reduce or cure the telltale signs of MSDs.